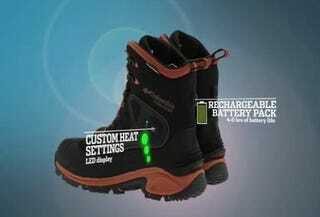 These boots will keep your feet extra warm, as they use built-in rechargeable batteries to heat them up for 4-8 hours straight. The Columbia Bugathermo boots will make your feet straight-up sweat even in the coldest of conditions, at least for a few hours. You'll want to start heading home when the battery display starts dropping, lest you're stuck out in the snow with just plain normal boots on instead of futuristic superboots. You wouldn't want that to happen!